Thanks for entering! We would be honored to host your special day at 4 Points Farm. • Contest ends June 15th at noon e.s.t. • Eligibility requirements- You must “like” and share our page. You must have a facebook status of “engaged” to be eligible to win. Winner is not guaranteed the wedding date requested during entry. Winner has 30 days after contest ends to choose her date. Winner must choose a date that is available at that time. If winner does not pick a date within 30 days of contest end, they forfeit their prize. Prize has no cash value. • Additional entries may be made after initial submission by leaving reviews of 4 Points Farm or taking a tour in person. • Prize is a venue rental for no charge. Winner will still sign a standard contract and agrees to adhere to policies of standard rental. 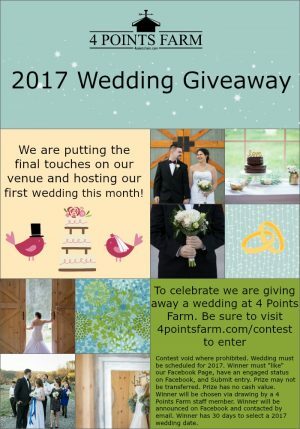 • Winner agrees to let 4 Points Farm use their name and photo in announcement. • Odds of winning depend on number of entries.